The all in one post…. Yesterday was a super busy day as we helped our friends install laminate wood flooring in two of their bedrooms. It turned out so amazing as they redid their base and painted their walls in yellows and light greens. But, let me back up for one second to the start of my day so I can give you all in all in one recap of the day. I started off my early morning with a little meditation and yoga before I headed to my Weight Watchers meeting. I weighed in backwards again but she said I did good and lost – yeah! I cannot wait to step on the scale tomorrow and FINALLY see my 14 day BBC results. I was sad when I found out my favorite WW receptionist is retiring and moving to Utah 🙁 But, my day was brightened when I saw the nail place sign next door. 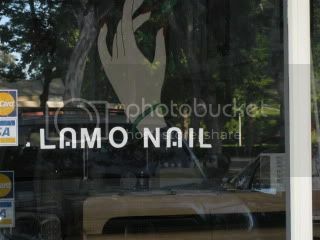 It’s supposed to say Alamo, not “lamo” Ha! 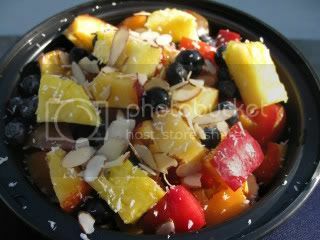 Yes, that is hilarious to me because I am easily amused have the sense of humor of a 12 year old LOL…..
Breakfast was a fantastic fruit salad that I made up for both The Husband and I. 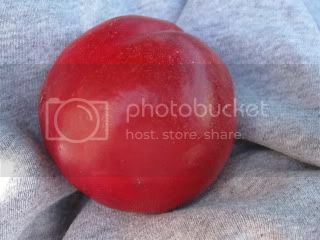 The bright red color is the Pluot – a cross between a plum and an apricot. They are my favorite! So sweet and juicy, but, their season only lasts about 1-2 months tops. 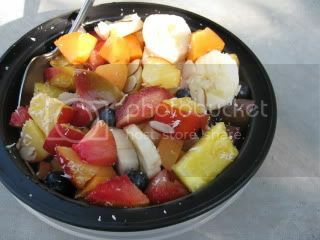 Then about 2 hours later, I had a white nectarine. We decided to work through lunch which I thought I could handle since I came prepared with a ton of BBC approved snacks. I didn’t have time to make up a lunch or I would have. I figured I would get a grilled chicken salad, but, that never happened. 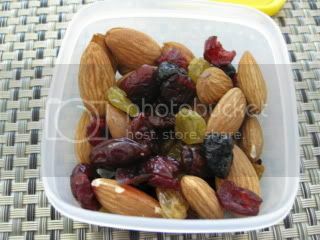 My lunch was my container of 100 cal almonds with a little TJ’s Berry Blend. Later in the day I might have also stole a handful of The Husbands peanuts (BBC approved) and then a handful of his Annie’s Organic Snack Mix Crackers. All was well and I drank a ton of water and was relatively satisfied with my eats all day. Then, the dreaded helping out your friends temptation appeared ~ Pizza! The only snack I had left at 6 pm was my sugar snap peas and my stomach was grumbling. I thought I could gracefully bow out and just wait it out when this plate was presented to me. I thought I could maybe get by with just a bite….um, ya, that was one bite too many. 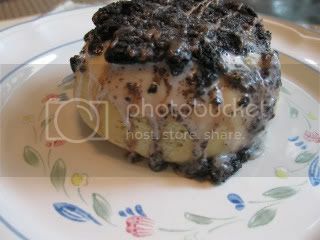 I know better – I am not the type of person who can eat just one bite and be like um, ok, I am sooo satisfied now. If I have one bite, I am pretty much eating it all. I WISH I had that technique – really I do. 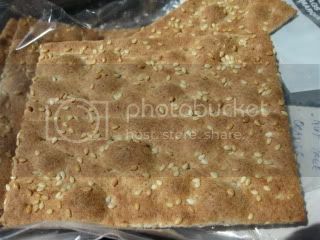 So, I had two pieces – they were amazingly cheesy, bready and good! I felt a little guilty but then I saw my stats this morning and feel like I earned it by running up and downstairs ALL day carrying the wood, cutting the boards, etc. Here is my big debate today. Do you all think I need to do a make up Bikini Bootcamp day since I didn’t fit in my cardio plus circuits and eats were a little off? So, that was my day yesterday! Fun, right? Today is another busy day, but, I am going to leave you with TWO fun things. * First, I won another COOL giveaway – Thorlo-Experia Socks! Click HERE to check out Erica’s rockin’ site and learn more about the giveaway. 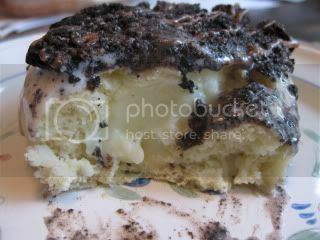 Here is a BIG hint for my giveaway that begins tomorrow ~ It is what The Husband had for breakfast – the name alone tells you how amazing it is ~ An OREO Cookie Boston Cream Pie Healthy Donut!!! Have a fantastic Sunday all! Catch you all later today when hopefully I get a little down time to catch up on comments, blogs and all that jazz! I think it's a great idea doing *blind weights* and weighing in backwards.. it takes off the stress focusing so intently on ONE SINGLE number. As long as your making progress you should be extremely proud of yourself.. keep up the amazing work girlfriend! dude, that is a LOT of calories and steps! 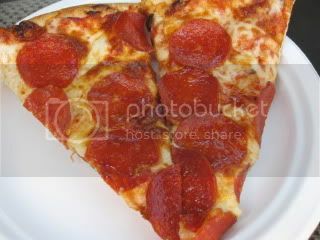 you are a rock star and i think the pizza is fine. if anything, it boosted your metabolism and tricked it into high gear. plus sometimes it is good to get that food hangover feeling to remember why eating clean is the way to go! utah! she's going to love it here! oh and i got a snicker out of the LAMO nails! There's a Chinese restaurant by my house that has a few bulbs burnt out in their sign. Instead of saying August Moon it's Augus Moo hah! I really got to give yoga another try. That is too funny about the nail salon. I love saying lmao. Glad you are having a great weekend. Jenny ~ Thanks! I agree – I never realized how much of a difference not watching the scale each day would make. It is definitely something I am carrying forward. Janetha ~ Thanks for the advice – it really made me feel so much better! K ~ Good point – you gotta have all the food groups to refuel with. That's funny about the chinese food place. Kristi ~ You should try the yoga downloads from yogadownload.com. They have a bunch of FREE 20 minute sessions and it's a great start. Try Gentle Hatha – it's my favorite for stretching and relaxing.